Recently I bought photoshop cs5, but it won't let me crop anything. I'm not sure if it's a bug in the program, whether the software I received is faulty, or if I re-install photoshop would that solve the problem? How is is preventing you from cropping? You really didn't provide much information about what you're seeing and what is happening on your system. Hello and thank you! when I finish cropping the file where I want it to be, I press enter and it goes incredibly tiny - maybe 1/4 inch square. Look in the options bar for the crop tool -- you forgot a value in there, like the resolution. Worst case, just reset the crop tool. Ooommmygoood. I suffered with this for months and out the blue thought let me Google with no hope for a resolution and within 30 seconds of following this all working!!!!! Thank u!!! Glad I Googled a solution as well! I just used your tip here and sham-wow! Wild that you posted it 6 years ago!!! Thank-you SO much! I was frustrated by this glitch for a couple of months, and wasn't able to find a solution online until today! I've bookmarked your site and again, thank-you! So simple - I feel foolish! Lol! Cuando utilizo la herramienta "Recortar" en mi Mac, Photoshop CS5 deja la nueva imagen en un solo pixel. Photoshop: Crop tool not working. I had similar difficulty! 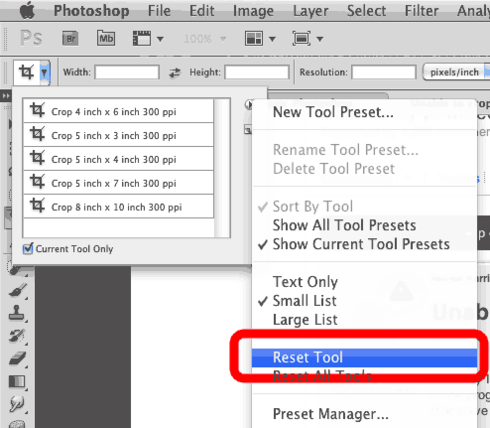 cropping any images regardless of size or os resolution would lock photoshop! resetting the tool helped me too! thanks - it was driving me nuts! This helped me too! Thank you soooo much!